Twelfth Bough: "peace" "process" "resumes"
Video from November 18, 1990, Israeli Prime Minister Netanyahu meets with Rabbi Menachem Mendel Schneerson of the Chabad Lubavitch Movement. 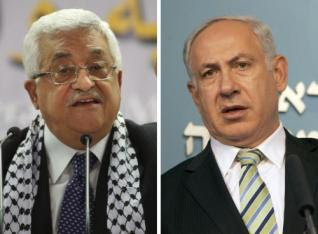 "Abbas (L) and Netanyahu are expected to go to Washington in September to start the negotiations, which will address the status of Jerusalem and the right of return for Palestinian refugees." "...The last round of direct talks collapsed when Israel launched a devastating three-week offensive in Gaza in December 2008 in a bid to halt rocket fire from the enclave ruled by the militant Hamas movement." Wonder if the IDF plants fired the rockets from gaza? Looks like BP was lying again, the cement did not stop the macondo well, the earth did, sea floor collapsed and feds admit it. The planet herself is making it harder to kill us. Florida Atlantic University was right! The tidal wave did not happen. Oil is not biodegradable now, toxic for decades. Florida State University.